The GLA 45 AMG is quite an interesting car, so much so that it borders on confusing. Mercedes would have you believe this is an SUV but walk up to one and you would agree that it isn't much larger than a supermini; a compact crossover at best. While that may not be highly appealing to the average SUV buyer, it's very positive for a car that claims sporting credentials. And make no mistake, under that taller body work lies essentially the same chassis and powertrain as that of the rapid CLA 45 AMG. But the GLA has a big potential advantage over its swoopy sibling - it comes with the promise of practicality. The CLA was crippled by its low ground clearance and stiff ride and we ended up scraping its belly a few times on our drive despite utmost caution. 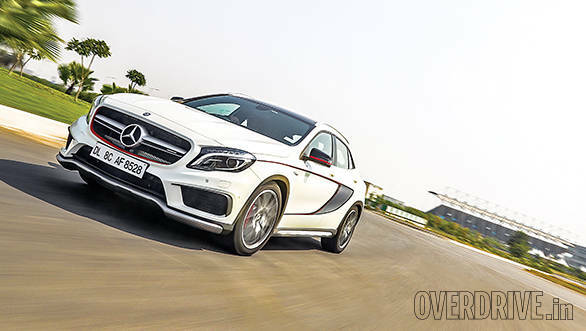 The fact that the GLA 45 promises the same explosive performance but without having to hold your breath over every speed bump makes it quite an interesting proposition for India. 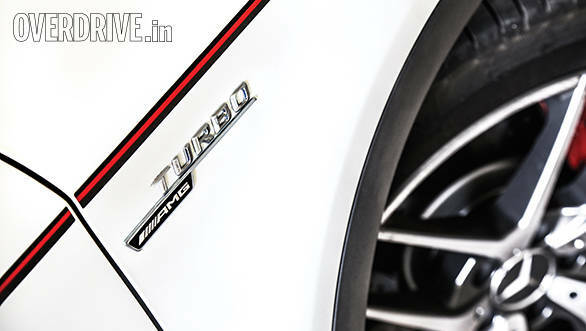 It has the potential to be one of the most practical sportscars for India which is quite exciting. Like most AMGs, the GLA 45 is based on a standard GLA, but treated to some go-faster bits that make it stand out. The front bumper is sharp with aggressive air intakes and a lip spoiler while the rear gets AMG's signature quad exhausts and a sporty diffuser. Our favourite angle is the side profile thanks to those lovely 19-inch wheels that expose big brakes and bright red AMG calipers. A rear spoiler adds to the extroverted sportiness. Fortunately, the stickers you see on the sides and red stripes on the grille and wheels are optional. All told, it's an attractive design but doesn't quite take your breath away like a CLA, or even an A-Class. The insides, like all the other MFA platform cars, are very familiar. 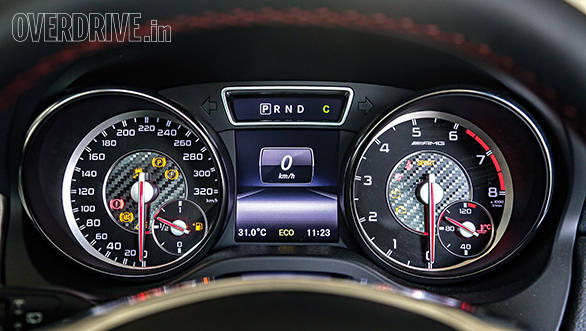 No contempt here though and the cabin looks attractive and sporty, aided by a lovely flat bottom steering wheel and conventionally positioned AMG gear selector. Right behind the selector lies a button to shift the car into Park mode. What I didn't like was that the button to switch between Manual, Sport and C (controlled efficiency) modes sits right next to the Park button. You have to look at what you're doing especially when crawling in slow moving traffic. Try to change modes without looking down and there's a good chance you can hit the Park button. We did, and the speed was low enough for the transmission to bring the car to a dead halt. That's a dangerous situation to be in and we were lucky the driver behind was attentive enough to stop in time. Button placement aside this is a lovely cabin. 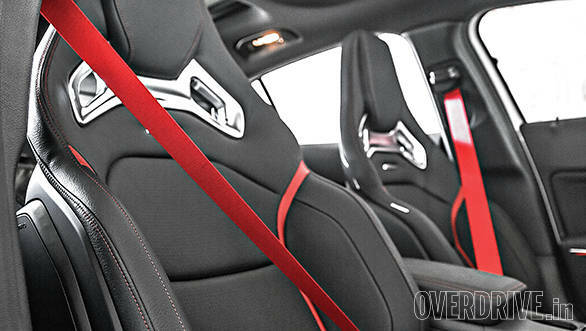 The seats are sporty but also very supportive and stayed comfortable for hours. Even the rear is comfortable for two with adequate knee and headroom - something the A- and CLA-Class both lack. 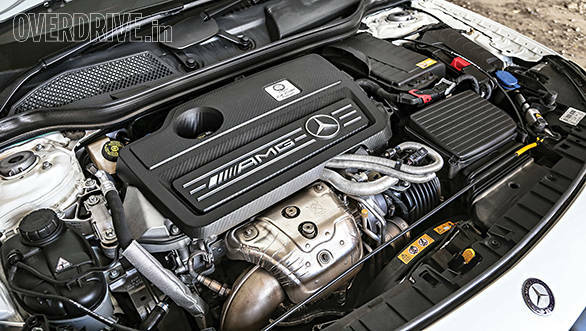 The GLA 45 is a true AMG in the sense that the engine is the highlight of the package. The 2.0-litre inline four uses a large variable geometry turbo to produce 360PS and 450Nm, huge numbers for the displacement. The engine is smooth and power starts building above 2,000rpm. When the revs cross 4,000rpm the motor comes alive and pulls hard till about 5,500rpm, tapering off slightly before the limiter cuts in at about 6,000rpm. What's really impressive is that despite the stressed nature of the engine, it feels smooth and refined at low speeds. Power goes to all four wheels via AMG's 7-speed dual clutch gearbox. We're not fans of most Mercedes gearboxes - they tend to be a little lazy, but this is the best of the lot so far. It shifts smoothly and quickly enough. That being said, it still lacks the sharpness we've come to expect of today's dual clutch boxes. 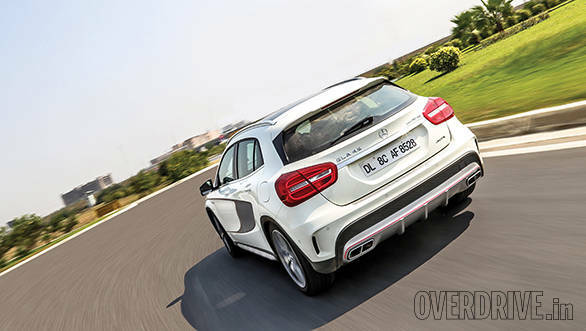 A sweet exhaust note is essential of any AMG so it's fitting that Mercedes offers the GLA 45 with its optional performance exhaust as standard in India. The sound is interesting - a mechanical growl with a mix of turbo whistle and loud pops from the exhaust on full bore upshifts. It's an enjoyable noise but not quite as epic as the bigger AMG's and not something you will yearn to hear at every opportunity. In town it feels just as easy to drive as any Mercedes. Mash the throttle however and you're treated to a serious turn of speed. The car launches hard in Race Start launch control mode and we recorded a 5.6 second run to 100kmph. The car pulls hard up to 200kmph and doesn't run out of steam till it hits its top speed of 250kmph. Surprisingly though, it's fairly efficient - we recorded 11.6kmpl at a steady 100kmph on the highway with the trip computer indicating about 8kmpl in city. Not bad at all given the performance on offer. On a smooth road the GLA 45 feels enjoyably sharp. Despite the extra ground clearance, the car shows hardly any body roll and offers huge levels of grip through its all-wheel drive setup. Power flows to the front wheels but the system can send up to 50 per cent of it to the rear when required. It is prone to understeer at the limit and we learnt that the best way to drive it is to control speed into the corners and use the grip and power to blast it out. The steering isn't very heavy and feels pleasantly direct even though it doesn't offer much feedback. Despite the perceptive higher centre of gravity, on a fast road the GLA 45 feels like quite the sportscar. The issue is that it also has the shortfalls of a sportscar, particularly in its hard suspension. Even in C mode, the ride is stiff enough for you to form an intimate relationship with all the imperfections in the road, small pebbles and paint strips included. On the plus side, the high ground clearance means you never have to worry about scraping the belly over bumps. In fact, it can even do some off-roading but we doubt you'll enjoy it thanks to the low profile tyres and rigid suspension. 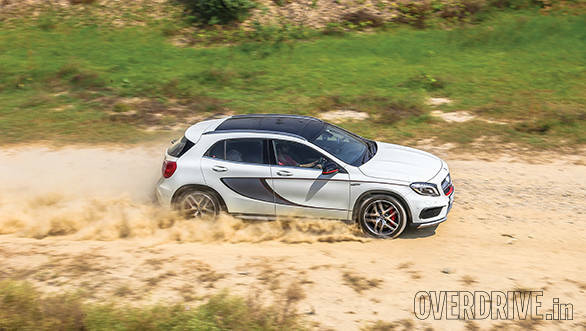 The GLA 45 AMG has no real rivals, perhaps save for the Macan Turbo which costs a whopping Rs 1.08 crore. The GLA 45 should be much cheaper, around Rs 73 lakh is what we estimate (Mercedes 45 AMG launched in India at Rs 69.6 lakh). It offers an interesting mix of sportscar performance with enough space for four, a decent boot and practical ground clearance. But I feel Mercedes has missed an opportunity with the suspension. If it was more supple and had the adjustability of say, the ML 63 AMG or a Cayenne this would have been a seriously effective car for our road conditions. All said, it offers some of the highlights of owning both an SUV and a sportscar but it's not the true, India-ready sportscar we were hoping for.